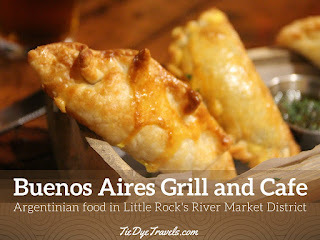 A Taste of Argentina - Buenos Aires Grill & Cafe in Little Rock's River Market. Taking on a spot formerly held by Juanita's Cantina and Bill Street, Buenos Aires Grill and Cafe hopes to draw diners down the stairs for Argentinian fare in the popular River Market District. This just might be the place to make a permanent residence of 614 President Clinton Avenue. South American cuisine... is just as diverse as North American cuisine, and lumping Argentinian with Brazilian or Peruvian or anything else is just a disservice. Hearing talk of "a new Latin place" going in by the Museum of Discovery didn't raise my eyebrows, but hearing that this joint was Argentinian drew my attention. So I was happy to accept an invitation to come try out Buenos Aires Grill and Cafe tonight. Hunter and I came in and found the table I almost always have sat at, no matter the restaurant - the one in the front window. We were given options for drinks (no alcohol for me, since I was driving) and Hunter was thrilled because she wanted - and got - a Fanta. And then came the food. We started out with a picada appetizer plate, which includes salami, prosciutto, several different cheeses, chimichurri olives and crostini bread. The bread in particular had a nice herbed flavor, still crisp, while the selection of cheeses impressed us. I'm all about some Muenster. I do believe the salami in question could be Spanish in origin. This dish made great finger-food. I could see sharing this with a table full of folks. A tray of five empanadas was delivered to the table. Our waitress showed us how to differentiate between the selections - the crimping gives it away. These are, from left to right, caprese (tomato, basil and cheese in a fold-over crimp), beef (tight crimp), onion cheese (triangle), chicken (loose crimp), and ham-and-cheese (circular). They were presented with a small ramekin of chimichurri sauce. I was taken by the simplicity and flavor of the onion and cheese empanada. The tomato-spiced chicken empanada had a gorgeously fresh flavor to it. Hunter wanted all of this ground beef empanada after a small taste. I appreciated the locely tones of mint and herbs within. And then there was this caprese empanada. Honestly, I'd never heard caprese and empanada together like this before. But it was certainly a hit with Hunter, who said it tasted a lot like pizza.Which, of course, it should, at least on a cheese-and-tomato basis. There were a lot of notes like this - which also emphasizes more modern influences on Argentinian food such as Spanish and Italian cuisine. Argentina is not in a vacuum, of course. To me, the biggest sign of that was the Mixta salad, a soaked salad with complex flavors that reminded me of my favorite Arkansas restaurant salad, the Mista at Lazzari Italian Oven in Jonesboro. Many of the notes are similar here - and best of all, this salad does not have the smack-in-the-face wang of vinegar that too many ther soaked salads possess. As I mentioned, I was driving, so I hadn't planned on alcohol. However, I was encouraged to try the sangria, which was brought to me in a simple shot. Boy, this would get me in trouble - sweet, almost tropical, with good quality white wine. The flank steak is where Hunter and I nearly got into it. Yes, my daughter loves a good steak, and this beef turned out to be some of the best she'd enjoyed. She wanted to eat all of it. I could not in good conscience let that happen. These morsels have that signature flank steak chew but are also packed with a lot of flavor, and are once again served with that chimichurri sauce. We were presented with tastes of two desserts - a marsala gelato and a panqueque dulce de leche.The former is prepared daily by a gentleman named Jose (I got to meet him, nice guy!) and the flavors will vary. I was impressed with the custardy notes. I have a better photo of this on my Instagram. Hunter got ahold of the panqueque and it was just gone. She loves tres leches and caramel, and this was a perfect apex in a crepe. I'm told the dessert menu will also include a quatro leches cake, and that's something I won't hesitate to try. Repeatedly. Buenos Aires Grill and Cafe opens next Thursday. It'll be open 11 a.m.-9 p.m., Tuesday through Saturday - and future plans include adding a Sunday brunch from 10:30 a.m to 2 p.m. For future reference and to plan your visit, call (501) 904-2133 or check out the Buenos Aires Grill and Cafe Facebook page.